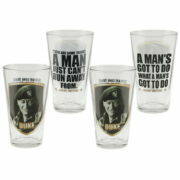 This is a set of four clear 16 ounce pint drinking glasses bearing the images of John Wayne in his role in the movie The Green Berets along with some of his classic phrases on the back. 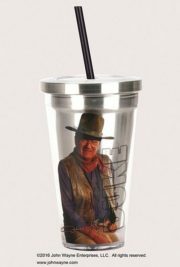 This is an 18 oz stainless steel lined travel cup with straw featuring the classic art image of John Wayne. 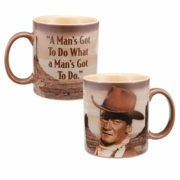 This is a new and unused 12 ounce ceramic mug featuring a photo image of John Wayne in his western garb on the front and on the back is his famous quote “A Man’s Got To Do What A Man’s Got To Do”. 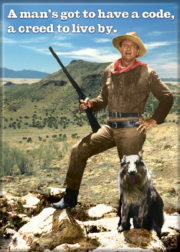 Produced by Ata-Boy this is a licensed 2.5″ X 3.5″ photo magnet bearing a photo western image and popular quote of the famous western icon John Wayne. 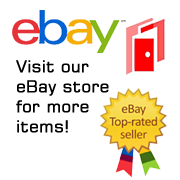 This is a 8.5″ x 11.5″ heavy grade tin sign that reproduces the classic western image of John Wayne standing in front of an American Flag with his replicated signature. These are produced in the style of the original tin signs that were common in the first half of the 20th century. This is a new and unused 20 ounce brown custom sculpted ceramic mug stein featuring a photo of John Wayne in his western garb on the front and his nickname The Duke on the back. This mug is microwave safe but should be hand washed and comes in an illustrated box. 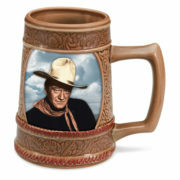 This is a clear 16 ounce mug/stein that features the art image of John Wayne above his name and the words “An American Legend”. 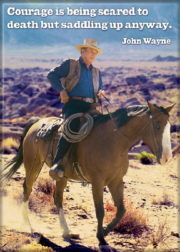 This is a 12 1/2″ x 16″ heavy grade tin sign that reproduces a collage of classic western images of John Wayne and the words John Wayne An American legend. These are produced in the style of the original tin signs that were common in the first half of the 20th century. 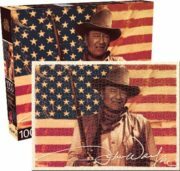 This is an unused, sealed, mint in the box 1000 piece jigsaw puzzle reproducing an image of John Wayne in one of his western roles standing in front of an American Flag. This 1000-piece puzzle depicts one of the tough-guy personas that helped secure the Duke’s indelible fame and legendary status. 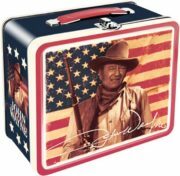 Produced in 2015, this is a two sided 7 1/2″ long x 4″ wide x 7″ tall metal carry all tin tote or lunchbox featuring the image of John Wayne in his western garb standing in front of an American flag. 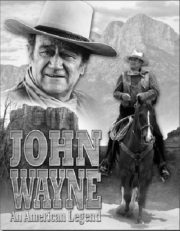 It depicts one of the tough-guy personas that helped secure the Duke’s indelible fame and legendary status. 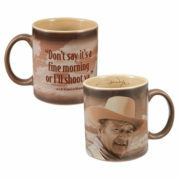 This is a 20 ounce brown ceramic coffee mug/stein with a black interior that features the art image of John Wayne over his nickname Duke on one side and his “A Man’s Got To Do…” quote on the back. Made from high quality stoneware it has a recessed sliding lid to prevent spills and is microwave and dishwasher safe (remove plastic lid before microwaving). 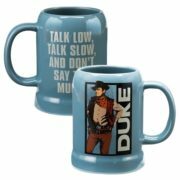 This is a light blue ceramic coffee mug/stein that features the art image of John Wayne along with his nickname Duke on one side and his quote “Talk Low, Talk Slow, And Don’t Say Too Much” on the other. This is a set of four clear 10 ounce drinking glasses bearing the images of John Wayne and Duke. They are new and unused glasses packed in an illustrated box. Hand wash only. 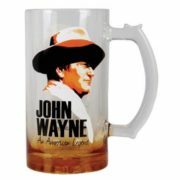 This is a set of four clear 16 ounce pint drinking glasses bearing the images of John Wayne and Duke. They are new and unused glasses packed in an illustrated box. This is an unused, mint in the box 1000 piece jigsaw puzzle reproducing an image of John Wayne in one of his western roles beside his famous quote about courage. Produced in 2011 by Aquarius and no longer being made, it is stock #65181, and measures 20″ x 27″ when completed. This is a new and unused 12 ounce ceramic mug featuring a photo image of John Wayne in his western garb on the front and on the back is his famous quote about a fine morning. This mug is microwave and dishwasher safe and comes in an illustrated box. 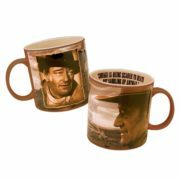 This is a brown ceramic coffee mug/stein with a black interior that features the art image of John Wayne from the movie The Searchers on one side and his nickname The Duke on the other. This is a standard regulation set of playing cards featuring vintage photos of John Wayne, with a different picture on each card. Produced in 2011, this is a limited edition hand painted ceramic mini bust in the shape of the figure of John Wayne in his role in the war movie The Sands of Iwo Jima. Measuring 4.25″ x 2.75″ x 5.25″ this is limited to 4800 pieces and comes with a certificate of authenticity and packaged in an illustrated box. This is a new and unused 20 ounce ceramic mug featuring images around it of John Wayne in his western garb and on the inner rim is his famous quote about courage.